A century ago, this was not the case. 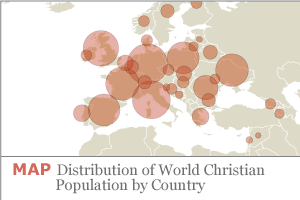 In 1910, about two-thirds of the world’s Christians lived in Europe, where the bulk of Christians had been for a millennium, according to historical estimates by the Center for the Study of Global Christianity.2 Today, only about a quarter of all Christians live in Europe (26%). A plurality – more than a third – now are in the Americas (37%). About one in every four Christians lives in sub-Saharan Africa (24%), and about one-in-eight is found in Asia and the Pacific (13%). 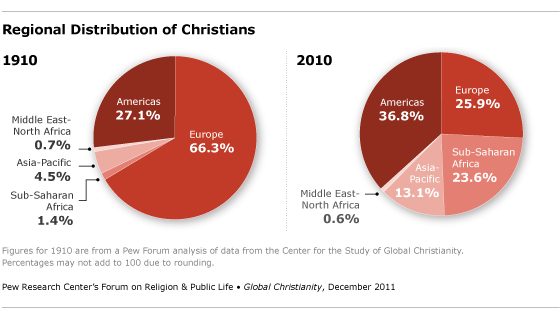 These are some of the key findings of Global Christianity: A Report on the Size and Distribution of the World’s Christian Population, a new study by the Pew Research Center’s Forum on Religion & Public Life. 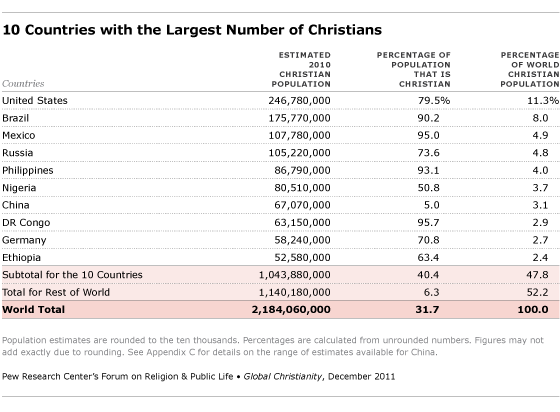 Almost half (48%) of all Christians live in the 10 countries with the largest number of Christians. Three of the top 10 countries are in the Americas (the United States, Brazil and Mexico). Two are in Europe (Russia and Germany), two are in the Asia-Pacific region (the Philippines and China), and three are in sub-Saharan Africa (Nigeria, Democratic Republic of the Congo and Ethiopia), reflecting Christianity’s global reach. Nigeria now has more than twice as many Protestants (broadly defined to include Anglicans and independent churches) as Germany, the birthplace of the Protestant Reformation. Brazil has more than twice as many Catholics as Italy. About 90% of Christians live in countries where Christians are in the majority; only about 10% of Christians worldwide live as minorities. In recent years, a number of scholarly books and articles have discussed the rapid growth of Christianity in the developing countries of the “Global South” – especially Africa, Asia and Latin America – and debated whether the influence of Christians in the “Global North” is waning, or not.4 A century ago, the Global North (commonly defined as North America, Europe, Australia, Japan and New Zealand) contained more than four times as many Christians as the Global South (the rest of the world).5 Today, the Pew Forum study finds, more than 1.3 billion Christians live in the Global South (61%), compared with about 860 million in the Global North (39%). But even though Christians are more numerous in the Global South, the concentration of Christians is much higher in the Global North, where 69% of the population is Christian. 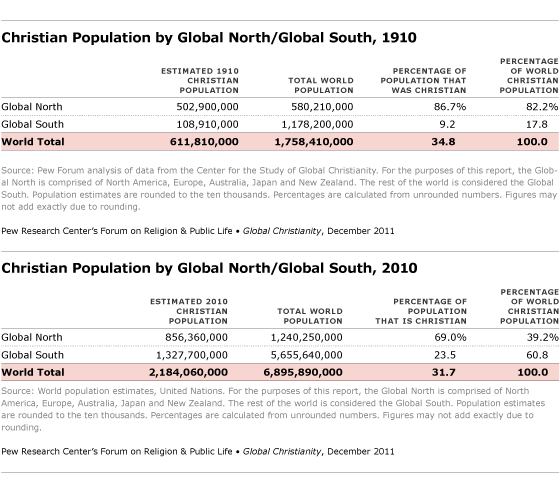 By contrast, 24% of the people living in the Global South are Christian. This reflects the fact that the total population of the Global South is about 4.5 times greater than the population of the Global North. 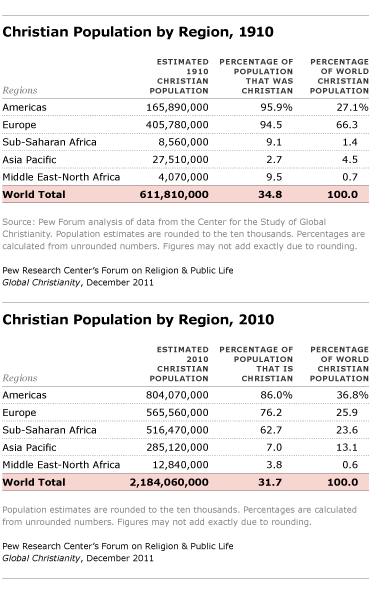 But sub-Saharan Africa and the Asia-Pacific region now have a combined population of about 800 million Christians, roughly the same as the Americas. And five of the top 10 countries with the largest Christian populations are either in Africa (Nigeria, Democratic Republic of the Congo and Ethiopia) or Asia (Philippines and China). Moreover, the fastest growth in the number of Christians over the past century has been in sub-Saharan Africa (a roughly 60-fold increase, from fewer than 9 million in 1910 to more than 516 million in 2010) and in the Asia-Pacific region (a roughly 10-fold increase, from about 28 million in 1910 to more than 285 million in 2010). In many countries, however, censuses and surveys do not contain detailed information on denominational and religious movement affiliations. Christian organizations remain in many cases the only source of information on the size of global movements within Christianity (such as evangelicalism and pentecostalism) and on Protestant denominational families (such as Baptists and Methodists). The figures in this report on pentecostal, charismatic and evangelical Christians and on Protestant denominational families were commissioned by the Pew Forum from the Center for the Study of Global Christianity at Gordon-Conwell Theological Seminary in South Hamilton, Mass., whose researchers generated estimates based in large part on figures provided by Christian organizations around the world. Readers should bear in mind that these breakdowns were derived differently from the overall Christian population estimates.